When I turned 18 I set myself the goal of reading the entire Bible cover to cover. I will turn 22 on October 2nd and I would like to have finished the Old Testament by that time. I took an introductory course in Bible and Theology last Fall and the professor, who is an OT scholar, asked the class if anyone read more Old Testament than New Testament in their personal reading. I was the only one who raised my hand, so I looked like a ridiculous OT show-off. I wanted to explain to everyone, "You don't understand, guys! I would read the New Testament if I could! But I am not allowed to yet because I am an insanely slow reader!" Just me, making some new friends during Freshman year. This project has been really hard to do because I have been so uninformed about the OT. So many of the things I was reading about like in the books about the prophets were confusing and boring. You may ask, "Uh, Lucy Rose, why didn't you read some books on the side to help you understand? Why didn't you consult your family's bookshelf devoted to theological studies? And once you got back to America, where they have huge libraries of stuff in English, why didn't you read about it then? Why didn't you ask your parents to help you!? WHY DID YOU PURPOSEFULLY STAY IGNORANT?!" Well, Folks, I just DID, OK?! I wasn't very smart about it. I also sort of told myself that I just read the Old Testament cold-turkey. I just hopped right in there and the turkey was very cold. Wait a sec…That sounded strange. Sorry. Now I am taking an Old Testament class, because after four years of Old Testament cold-turkey-ing about I will finally understand what the heck Ezekiel was about. It is kind of like developing a weird friendship over the course of four years with someone who never talks about their family. Then one day you go to their family's house for dinner and you're like, "Oh my gosh! I suddenly understand this person a lot more. That's why they never eat meat!" That is a weird analogy. But do you get the idea? I am excited to learn about the Old Testament from an academic perspective after having been forming this strange relationship with it for the last four years. I both love and hate the Old Testament. 1) It is very long. Like thousands of pages long. All of the things on my second list are things that I am getting over thanks to my new class. It is a very hard class for me, but I am learning a lot. 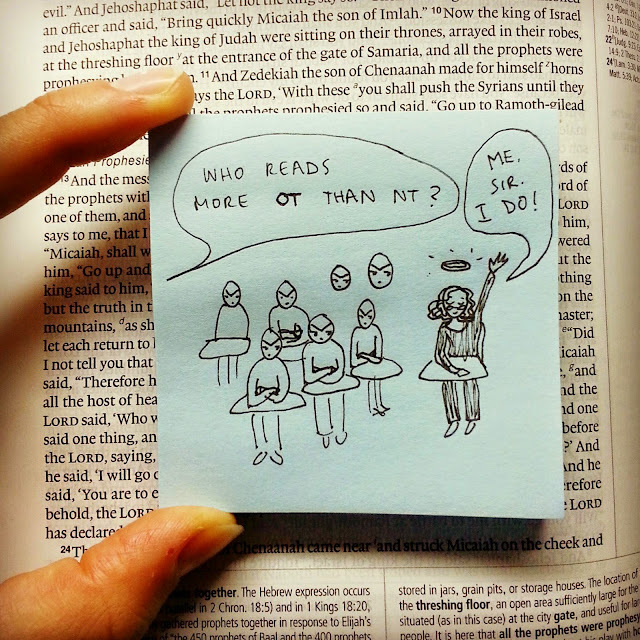 I enjoyed this post, Lucy, as I've been reading the OT chronologically since June 2013 ... and ... hurrah!! ... I will finish it by Sept. 30, 2014!! I have to say that reading it in chrono order has been immensely helpful to me. That said, I'm SO READY to read the NT!! Hang in there!